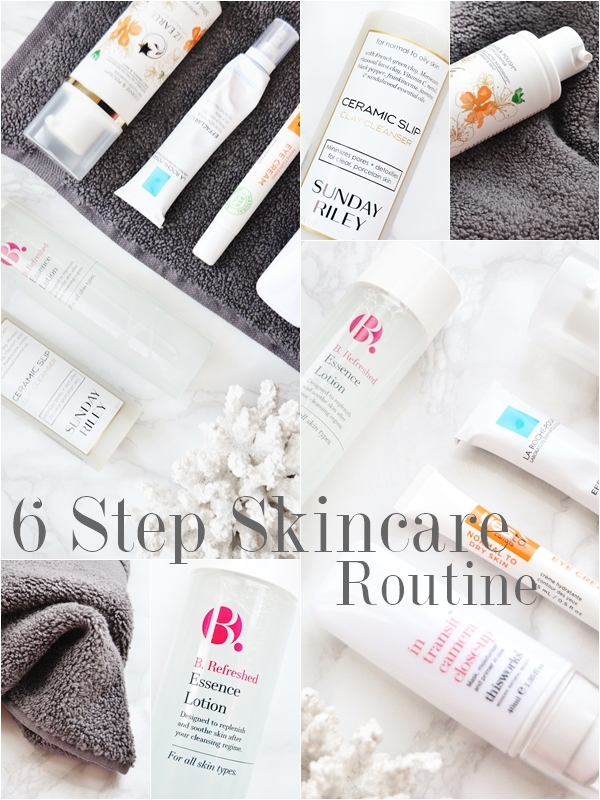 You may remember me mentioning in my New Year's Resolutions post I want to create a solid skincare routine and stop trying so many new products! This is easier said than done for a beauty blogger, but for the past week I've been selecting products I love the most and that have been working well for my combination skin, and I think I've created the perfect routine for myself that I will enjoy using and most importantly keep up! Below are six products that are divided equally to be used morning and night and though a few are specifically for oily/combination skin there are products here that suit all skin types so do have a read if you love skin care or want to start getting your own skincare routine sorted. Washing the excess oil and grime away from your face after a night's sleep is important and for my oily t-zone I've always liked to go for something a little foaming and something that will leave my skin feeling ultra fresh and clean. 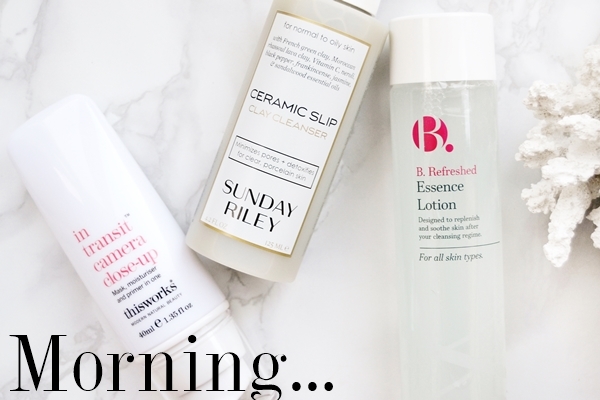 This is why I went for the pretty pricey Sunday Riley Ceramic Slip Cleanser when figuring out my new skincare routine. Firstly, if it's good enough for Karlie Kloss then it's good enough for me. Secondly, the ingredients in this are some of the best I've seen in a cleanser and really do warrant the slightly hefty price tag; though only a small amount is needed I should point out. With French Green Clay being one of the main ingredients in this cleanser it almost feels like a more liquid wash-off face mask that you don't allow to sit on the skin but is powerful enough to instantly purify the skin, leaving it squeaky clean and clear if you keep up using it for more than 2 weeks. I wish I could ramble on about this cleanser more as it's something pretty unique but on the whole it works amazingly well on combination/oily skin. This is a new product I decided to slot into my morning skincare routine and again one that needs explaining, especially as essence lotions aren't common in the UK at all yet. Derived from Korea, Essence is a different product all together from a toner though used after cleansing and before moisturiser. It's on the whole much more hydrating than a toner with key ingredients such as hyaluronic acid and glycerin to keep the skin much more hydrated throughout the day and is a much more long-term product to keep youthful skin free from early signs of ageing. Also with the instant hydration it takes away that tight feeling your skin may have after cleansing as restores it to skin that feels like your own but without a moisturising residue that sits on the skin. Due the the Essence Lotion feeling like a toner in consistency it's easy to treat it is one but instead of applying the liquid on a cotton pad and sweeping around the face you simply add a few splashes to your palms and pat over the face. For someone like me that wants the hydration but without the residue sitting on my skin before moisturiser then a product like this is perfect. To finish off my morning skincare routine I needed to select something that moisturises my skin without clogging my pores and for the last month or so that's been this wonderful moisturiser that's actually a 2-in-1 product as it also acts as a primer. This is another celeb favourite with Victoria Beckham saying she loves to use it and as she also has oily skin I can totally see why. This is almost a balm-like moisturiser that really does soak into the skin pretty much instantly so there's no slip/residue on the skin, perfect for apply makeup onto to. As for the product working as a primer this creates the smooth base perfect for foundation and you do find it slightly brightens the skin. If you are thinking about buying this product I'd certainly suggest snapping up the Look Fantastic deal as the Sleep Plus+ Pillow Spray is another amazing This Works product. When it came to deciding what my evening cleanser should be I knew it would have to be something simple yet effective. Which is why I was instantly drawn to Liz Earle's Cleanse & Polish, a product I've used on and off for 4+ years now. This is simply the best cleanser I've come across for quickly removing makeup and the grime of the day without irritating or over cleansing the face, plus its a joy to use as it's creamy in consistency with a pleasant scent. However I personally prefer to use a nice thick flannel over the provided muslin cloth as I find flannels keep their heat as you use them and remove the cleanser more thoroughly. My favourite face cloths to use are from Debenhams and cost only £1 here or in-store. Due to having an oily/combination skin type I've always been weary of applying a night cream as this has blocked pores in the past and resulted in spots to appear. 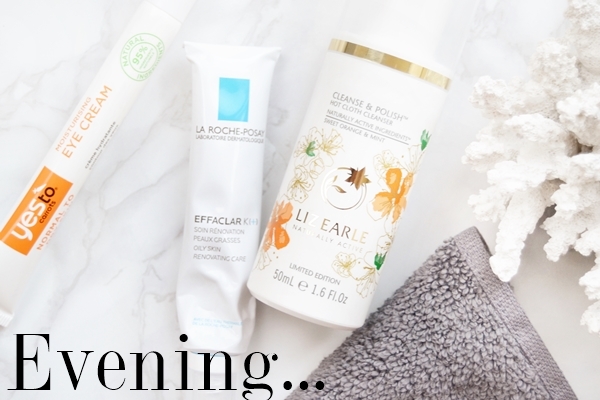 However one skincare line that totally understands blemish-prone skin is La Roche-Posay and their Effaclar K+range is one of the best for improving skin texture and keeping spots at bay even at night. This isn't one for sensitive skin types as it does feel a little potent when applying it but it does soak straight into the skin without leaving a greasy residue. When used daily I find my skin texture improves so much and is bump-free and looking more radiant. In the past I've used Effaclar K so I'm excited to try the latest improved addition to the line and will give an update on how I'm getting on with in a few months... though I'm sure it will only do wonders for my skin! Lastly I knew I had to include an eye cream to my new routine as I've vowed to give eye creams a go in 2016 as I'm turning 28 this year after all! But the thing is I've yet to find the one for me. So even though I'm going to start using the Yes To Carrots Moisturising Eye Cream I'm hoping to find something more suitable in the near future as I have a feeling this specific eye cream will be too heavy for me and create small spots around my eyes which I've experienced a few times using various eye creams. I'd love to find a gel/cream hybrid that's light yet affective and not too pricey, so if you know of any good ones make sure to let me know in the comments! So there you have it, my new skincare routine for twenty sixteen! I wil be sure to do an update post on this in the next few months to let you know how I get on with it.